An easy way to have dinner done when you get home. Also great way to make chicken for tacos or other recipes that call for cooked chicken. Lightly brown the chicken with a little lemon juice. Add spices, additional lemon juice, and chicken broth. 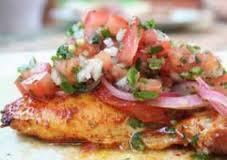 When the chicken is cooked thoroughly, add fresh tomatoes and cilantro and cook for 5-10 more minutes.